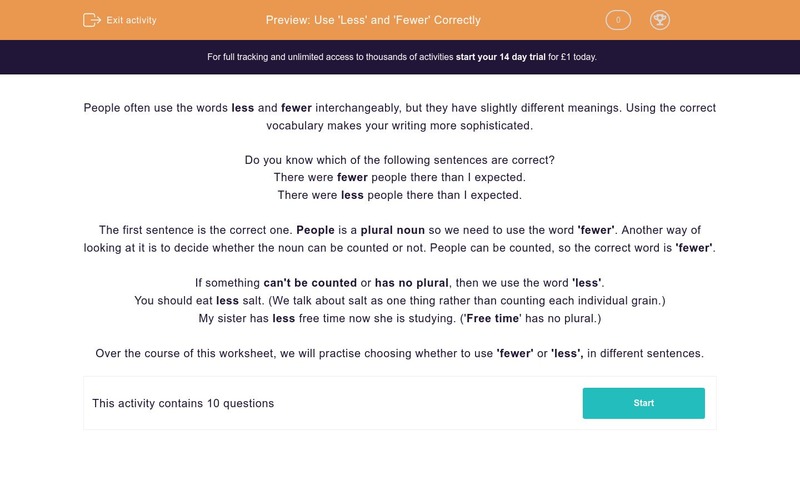 In this worksheet, students practise using 'less' and 'fewer' in the correct contexts. People often use the words less and fewer interchangeably, but they are not quite the same. Using the correct vocabulary makes your writing more sophisticated. Do you know which of the following sentences is correct? There were fewer people there than I expected. There were less people there than I expected. The first sentence is the correct one. People is a plural noun so we need to use the word fewer. Another way of looking at it is to decide whether the noun can be counted or not. People can be counted, so the correct word is fewer. If something can't be counted or has no plural, then we use the word less. In this worksheet you can practise choosing whether to use fewer or less in different sentences. Choose the correct word to complete the following sentence. Jake has __________ pocket money than Andrew. The doctor told my dad that he should smoke __________ cigarettes. There were __________ people at football training tonight because of the bad weather. I am trying to eat __________ chocolate now so that I can lose some weight. Jodie ate __________ pieces of cake than Tommy. There are __________ bees in our gardens than there used to be. I am going to put __________ sugar in my tea from now on. Police figures show that __________ people are drinking and driving than 30 years ago. We should make __________ car journeys if we want to cut our carbon footprint. Our apple tree has __________ apples on it than last year. 'Pocket money' has no plural so the correct word is 'less'. 'Cigarettes' is a plural noun so we need to use the word 'fewer'. 'People' is a plural noun so we need to use 'fewer'. When we talk about chocolate in general terms it cannot be counted. If we talked about bars of chocolate then it would be 'fewer bars of chocolate' because bars can be counted. The pieces of cake can be counted. 'Bees' is a plural noun and bees can be counted. 'Sugar' is not a countable noun. We think of it as one thing even though it is made up of separate grains. 'People' is a plural noun and people can be counted. 'Journeys' is a plural noun. We can count journeys. &apos;Apples&apos; is a plural noun and apples can be counted.